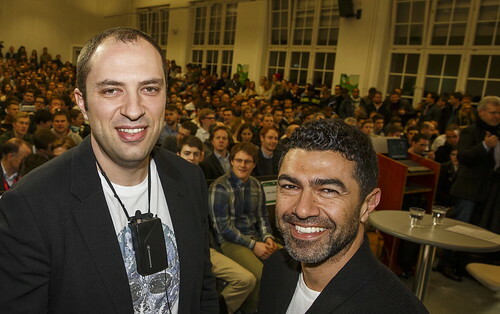 Four weeks ago, we had the privilege of hosting Jan Koum, the founder of Whatsapp at DLD14 in Munich. David Rowan interviewed him in a very telling interview. In the light of today's news of Facebook buying the messaging service for 19 billion dollars, we pulled together a brief summary including quotes from Jan Koum, Mark Zuckerberg, and Jim Goetz. At DLD14, Jan Koum used his extra-rare public appearance to make strong statements: No Exit, No Ads, and Data Protection! Watch his talk and listen for yourself. Certainly, 19 billion reasons are enough to change your mind. Facebook’s Cory Ondrejka, VP Mobile Engineering, Amin Zoufonoun, VP Corporate Development, and Sequoia’s Yinglan Tan attended DLD14, too. They listened to his statements carefully and used the opportunity to chat – potentially nailing down the deal? True to its legacy, DLD hopes to have served them well as a platform for business. The acquisition comprises a mixture of cash and shares in Facebook. For a company of only 32 engineers, each supporting 14 million active users, in a highly competitive market. Sequoia, the exclusive VC involved and mastermind behind the deal, is the hidden champion: it turned an 8 million $ investment into 3,5 billion $ gain. On the one side, WhatsApp has completely transformed personal communications with the advent of smartphones, which was previously dominated by the world’s largest telcos. The mobile messaging service is used by over 450 million people on every major mobile platform. 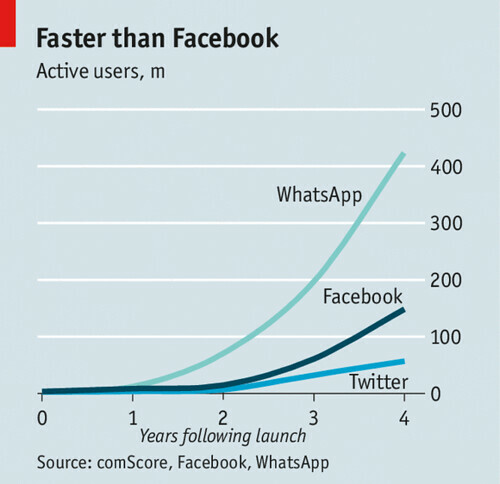 More than 1 million people sign up for WhatsApp every day. On the other side, Facebook is THE online social network with more than 1.2 billion monthly active users. However, Facebook has been losing some of its cool recently, especially among younger users. After having spent around $1 billion for Instagram in 2012, Zuck is bringing his expansive and expensive strategy to a whole new level. A match made in heaven? Well, let's note they are no soul-mates. Despite the shared vision of connecting the world, there are some radical differences: Jan Koum has a well-known aversion to collecting people’s data and plastering advertising over his app. According to Sequoia's Jim Goetz, Facebook has assured Jan and Brian (Acton) that WhatsApp will remain ad free and they will not have to compromise on their core principles, which are best summarised in a note from Brian taped to Jan’s desk that reads “No Ads! No Games! No Gimmicks!”(You can find Jim’s illuminating blog entry on the deal and its four magic numbers - 450, 32, 1 and 0 - here). Clearly, the deal was one that Jan couldn’t refuse. It is going to be interesting to see if he, as a new member of Facebook’s board, will continue to champion the rights of WhatsApp users. On behalf of the DLD founder Steffi Czerny, DLD chairman Yossi Vardi, and the whole DLD team we wish him endurance and congratulate whole-heartedly.